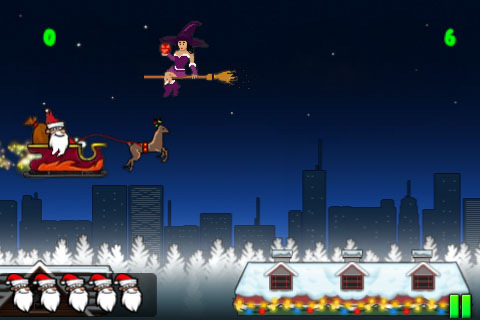 Christmas Wagon is a gaming app that puts the user in control of Santa’s sleigh as it cruises rooftops delivering presents. 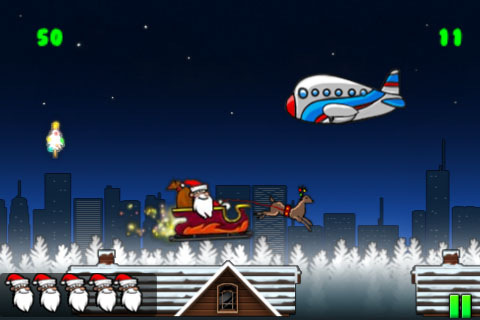 This festive app costs $0.99 and was created by RavenMyth Interactive Studios for an iPhone, iPod Touch, and iPad. It is a good thing that you are given 5 lives at the outset of Christmas Wagon because with the way the controls are set up you will need them. It took me some time to get used to the controls and the directions provided are not helpful. Santa’s Wagon will speed or slow to wherever you touch the screen. Make sure not to touch Santa though, because touching him drops gifts from the sleigh. Once you have the coordination down—touch around Santa to move, touch Santa to release the presents for points—the game is quite enjoyable. You control Santa’s big night out as he decides who has been naughty and nice. As you go from rooftop to rooftop some chimneys are lit up and it is up to you to release the presents into only the glowing chimneys. Along the way there are perils that obstruct Santa’s path including a witch on a broom, a plane, a blimp, a bat, and a gremlin. You have to be quick and navigate the sleigh away from those objects. The problem I faced with the controls is mainly the speed. The way the controls are set up is not necessarily bad, but it does not allow for an even pace and the accuracy with which I try to aim and move Santa is thrown off. There are other objects in Santa’s path, candy canes, toys, and glowing gifts that you have to pick up to add to his presents sack in the back of the sleigh. If you run over the glowing snowman then the speed of the sleigh will slow. Christmas Wagon is a lot of fun, especially since I love playing Christmas themed games around the holidays. I commented frequently on the way the controls are set up because I felt that they were blocking me from fully enjoying the game. That does not automatically kill it for me though and I am not the most experienced gamer so I am sure that the coordination problems I faced playing this game will not be universal. AppSafari review of Christmas Wagon was written by Vanessa Paszterko on December 20th, 2010 and categorized under Action, App Store, Fun, Games, Strategy. Page viewed 5296 times, 1 so far today. Need help on using these apps? Please read the Help Page. Looks simple and visuals look great. Santa Clause iphone christmas present for the time pausers. Christmas Wagon Is simple,basic and good.